God’s heart is expressed for the postmodern generations in the relationship and trust that is provided by youth cell groups. A safe place is provided to learn, discuss, cry, get healed, develop gifts and reach out. Learn the values behind youth cells and custom-design your cells for your youth. 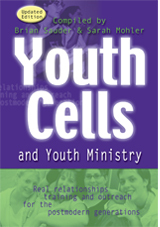 This book gives revealing insights into today’s youth culture, along with the specifics of implementing cell ministry. Includes a cell leader’s job description, creative ideas for youth cells, ministry from junior high to young adults, and how to transition to youth cells.